As with any cooking equipment, your gas barbecue needs to be cleaned properly. Not only does this ensure you don’t poison your guests when they come to enjoy the next Saturday afternoon food fest, it also ensures your barbecue is well maintained and lasts a lot longer. Here’s our quick guide to getting it done in no time at all. The first thing that barbecue fanatics get wrong is that they put off the cleaning and then forget about it. By the time you get that next sunny spell and want to get the barbecue out, you’ve got a lot of work to do. Try to get into the habit of cleaning the barbecue straight after the food is finished. It should take no more than fifteen minutes if you have the right equipment. 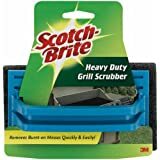 • A wire brush for cleaning the grill. • Some gloves to protect your hands. 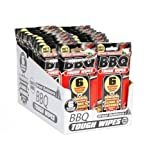 • A cloth to wipe down surfaces. • Some warm water with a little washing up liquid in it and a general-purpose kitchen sponge. • Glass cleaner for enamelled surfaces and a stainless-steel cleaner for metal surfaces. Close the lid and leave the barbecue on for about 10 minutes after you have finished cooking. This will bake off the grease, particularly around areas like the grill, and make it easier to remove. Once this is done, leave your barbecue to cool. Always disconnect your equipment from the gas supply before you start cleaning. You can use your wire brush to get rid of carbonised grease on the grill and the lid. This usually involves a little elbow work and if the grill needs further cleaning you can soak it in some warm soapy water and then use a kitchen sponge to get off the excess. If you have extras like a flavouriser, these can be washed too. You can clean areas such as the lid or surrounding panels with warm soapy water and then use a glass cleaner and cloth to buff it up a little. If there are exposed metal parts, using an appropriate cleaner here will help keep it in good condition and avoid problems like rusting. The other main part where grease and food can collect is around the gas burners. 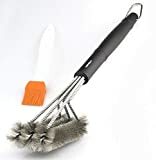 You can use something like a barbecue skewer to clean difficult areas like the gas outlets and again use the wire brush to remove food and grease deposits. Gently wash with warm soapy water and wipe away with a cloth. If you have any area that food or grease will settle, then these all need to be cleaned. Many barbecues nowadays have drip trays which can be easily removed, emptied and then washed in warm soapy water. Finally, if you want to get your barbecue ready for its next outing, coating the grill in vegetable oil before you put it back is an excellent idea and can prevent problems such as rust developing.